miminashy--you really need to check out the documentation for your psu so you understand exactly what youre working with. if it did not come with docs, email the company and ask for them and figure out how it works and/or ask. you should not experiment with your psu, its dangerous. Wahaha, you're right, consumed. Nobody wants to read the end to this story in the Darwin Awards. I'll be extra careful. 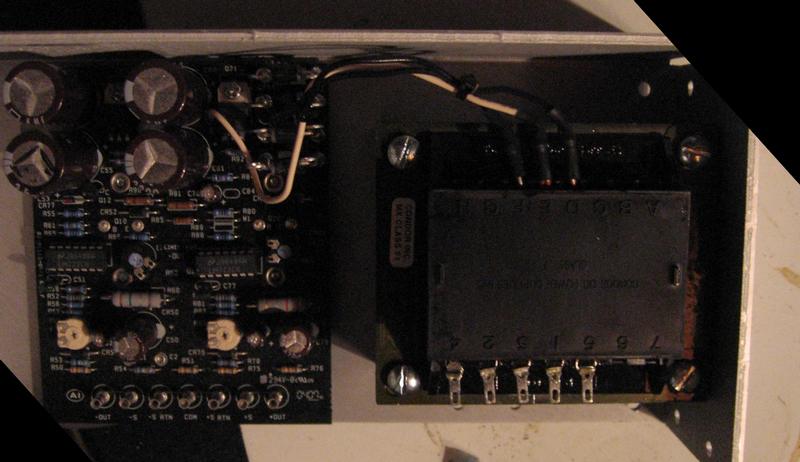 I was almost ready to throw in the towel and just get a Doepfer DIY kit, but the bus boards are just so damn easy to make and I already have all of the parts I need to complete the PSU so I'll just snag another unit and put this baby to bed. I'll let you guys know how it works out. Thanks for all of the info. If the psu doesn't supply negative voltage, that would explain the strange behaviour of your filter. Hopefully the place you bought it from has a +/- psu which you can swap with the one you have. Good luck! however, you can also use International Power or Condor brand PSUs with similar specs/model numbers and they're usually a bit cheaper for some reason. i didnt include the triple supplies although those would work too as long as two of the three outputs put +12v and -12v. i just recently purchased a bunch of surplus HAA15-0.8-A for $9 each on ebay. one of them is powering four schroff racks. the only pain about getting surplus PSUs is that there's old wire and solder already attached to the terminals that need to be cleaned up a bit. calibration of the psu is also necessary. Luka, here's an image for posterity. Let nobody else make the same mistake I did. Consumed, I reckon I'm probably gonna pick up one of those HAA15s or something similar. They're just so damn cheap. 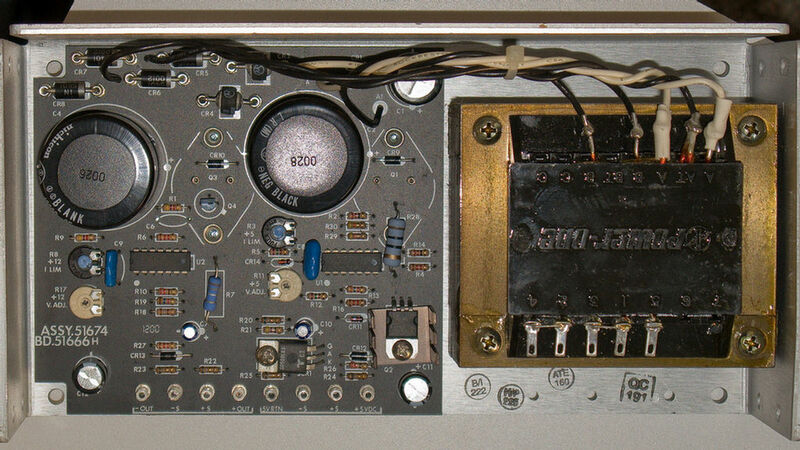 Would one of the smarter PSU-savvy folks here be able to comment on whether a pair of HCC15-3-A+G (3A+@12V) or a single HDD15-5-A+G (6A+@12V) look about right to run a DIY 4x9U euro setup, and what 'gotchas' there might be. My current setup is in 4x6U, with 3x1.2A and 1x650mA, and I reckon its got about 30% headroom on each of the 1200mA Doepfer supplies, so thats what Im basing my expectations on. if it is just a transformer you would have to get a higher voltage one to use 12V as you regulate down to 12v from 15v or so. well that is how it works for me with the flow i know, though i know only what i have picked up around the cloud. in regards to amp you should read that other thread on module draw and calcutate the draw of your moduels in milliamp and just make sure that it is more than that and what you percieve to fit into in the future. Sean you are gonna need some serious power for all that euro space you've just acquired!! I've got four of the 3U Schroff racks, and a 3.4amp supply... i think it's going to be VERY close.... I only have a handful of modules, but I've looked at all the ones I want to buy, and an (only slightly conservative estimate) says I should plan roughly about 600-800ma per 3U rack. A while back I got a 5 amp power one from ebay for $17. holy crap, now that's a score!! Well, its only 12U more than Ive got filled at present, and Im easily managing that with a total of about 4A of PSU. I really do think the Doepfer 1.2A supplies have got a fair bit of headroom supplies for my setup. What kind of modules are you talking about? Ive just calc'd the average power draw of the Doepfer, Harvestman, and Bananalogue modules in your tables, and it comes to less than 45mA per module. Maybe PlanB and Livewire are heavy, but there's no figures for them... but checking the modularplanner, the highest draw for a PlanB is 100mA, and thats an 18HP wide module. If I'm lucky the 3400ma will cover four of the 3U racks.... if I'm unlucky it won't. Get a piece of sheet metal, or even better some plexiglass, and make a frame/cover for it. If you're shrinkwrapping things I assume you have a heat gun, right? Then acrylic/plexiglass/"perspex", for sure. probably not. im powering four schroff racks from a 1a power one supply just fine, so im not sure what muff is putting in his rig, but that current draw is possible if he's using lots of digital. yeah Sean, I think you are right actually.... which is good news as that means I'll have more than enough power for my rack. On the other hand, my estimate is close over the short run - I just went over 700ma of usage, and I just went onto my second rack, so i'm just under 700 for one. But, I don't think this trend will hold, and it will average out lower per-rack once I get more filled. I have a lof of heavy pullers in this first rack - Z5000, Tyme Sefari + Expansion, etc. So yeah, it depends on what you get in there - and you're right that with something like an AFG you can only get three in a rack anyway. Maybe 500-600ma per rack is a more workable estimate and still giving some headroom. I'll keep this thread updated as I fill up my four rows - we'll see how it goes. Awesome matthias, thanks for the info! When I put my DIY PS together about a month ago I was wondering about this. I saw some pictures where people left those terminal unconnected and I saw some pictures, on Synthesizers.com (http://www.synthesizers.com/q101.html), where it looks like they are all connected together or something. I kept meaning to ask but I was a frightened noob so I just gave it my best guess and it 'seemed' to work. I'll have to study up on this and make the nessesary changes. PS - this is how my PowerOne supply is wired at the moment . 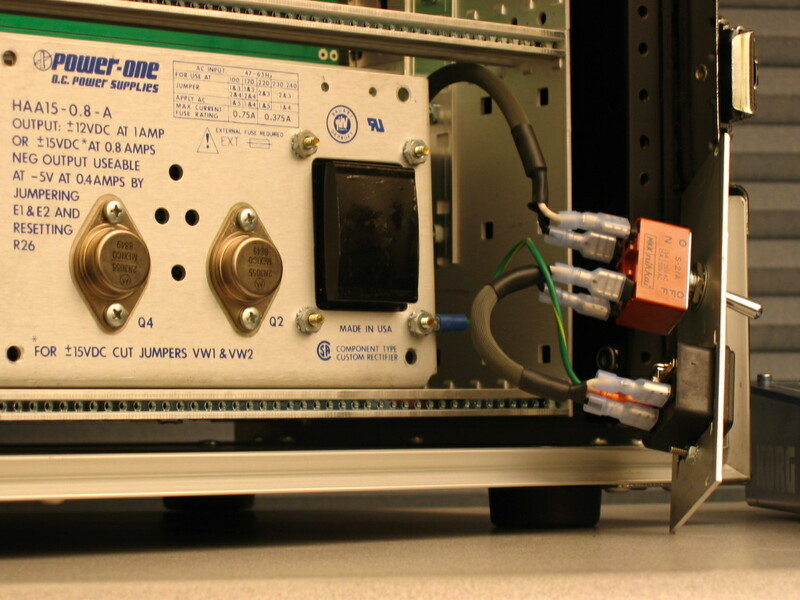 . .
connect the sensing terminals to the respective voltage outputs (-S to-OUT and +S to +OUT). conenct both return sensing terminals to COM (-S RTN and +S RTN to COM). Fantastic! I misread those as "5" and not "S"...I thought they were part of the 5v power sytem. Shows how little I know! Fantastic! I misread those as "5" and not "S"...I thought they were part of the 5v power sytem. should this PSU output 5V? i can see two trimmers. so i'd thought this would be a dual output supply? this makes way more sense now, thanks again! luckily i've only hooked up a few modules and haven't had any problem with the power, but i'm going to re-do things and hook up those sensing terminals later today. It would have never occured to me if you hadn't made that post - I've never heard of 'sensing' before in my life!